When September rolls around each year, people are excited because it means the start of football season. I, on the other hand, am usually less than thrilled. It means Sunday and Monday nights are filled with footballs games, meaning nothing good is on tv. So this September, I decided to have an attitude change. I was going to convince myself to like football. I mean, I like the idea of liking football.. rallying around a team, feeling like you’re a part of something, following your team’s progression through the season. So I tried. I think I watched part of 2 games. But I couldn’t get hooked. It was slow moving and it seemed like every other player was running out of bounds and than a flag was thrown. Plus, how am I suppose to relate to a 30 year old professional football player? See, there is something I like about football! The football itself!! Ha. If you have some tips on how I can start to like football, please leave me a comment, I would like to be able to enjoy America’s favorite sport. In the meantime, I’ll leave the football watching to the football fans and I’ll stick to making the game day food. This recipe for peanut butter stuffed chocolate footballs only calls for 9 ingredients! It does require a little bit of time because the chocolate needs to harden once you dip the peanut butter stuffed sandwiches. And piping on the details of the footballs can take up to 20 minutes, depending on how many you make. Next week is football week on the blog! 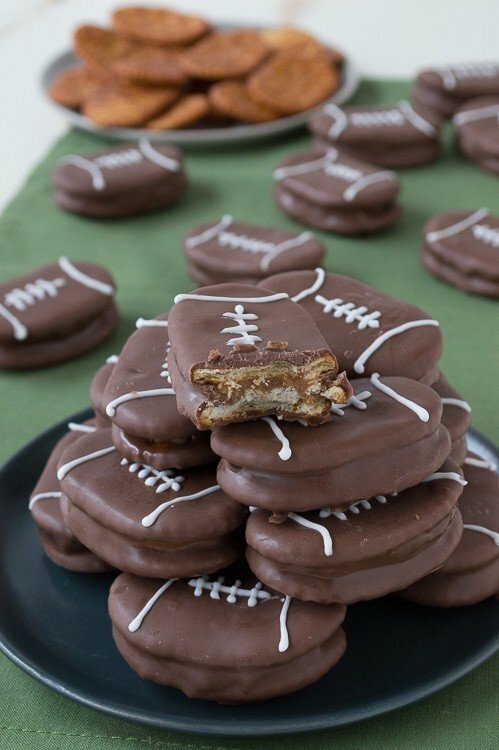 We’ll be sharing 3 new football treats to get you geared up for Super Bowl! In a mixing bowl, combine the peanut butter, powdered sugar, and cream cheese until smooth and evenly mixed. Using your fingers, take some of the peanut butter mixture and place it on a pretzel cracker, then stack another cracker on top to create a sandwich. Continue this process until you have made your desired amount of sandwiches. Place the sandwiches on a baking sheet and place them in the freeze for 15 minutes. While the sandwiches are hardening begin to melt the chocolate and vegetable shortening in a small saucepan over low (number 2-3) heat. It may take up to 10 minutes to completely melt the chocolate, stir occasionally as it melts. Set a cooling rack on the counter near where you will be dipping the sandwiches. I like to place a baking sheet underneath my cooling rack, so the drips of chocolate go onto that and not my counter, or place a piece of wax paper underneath the cooling rack. Spray the rack with non-stick cooking spray, this will prevent the melted chocolate from sticking to the rack, making the sandwiches easier to remove once cooled. Once the chocolate is melted, remove the sandwiches from the freezer. To dip, place 1 sandwich in the saucepan with melted chocolate. Use a spoon to spoon chocolate on top of the sandwich, if needed. To remove the sandwich, use a fork to lift it out of the chocolate. To remove excess chocolate from the sandwich while it’s on the fork, tap your wrist 2 times with your other hand, to get the excess chocolate to fall back into the chocolate bowl. Scrape the bottom of the fork on the edge of the saucepan to remove more chocolate, then move the sandwich to the cooling rack. Use a toothpick to help get the sandwich off the fork and onto the rack smoothly. Continue this process until all of the sandwiches are dipped. Allow them to harden at room temperature. While the sandwiches are hardening, mix the royal icing. 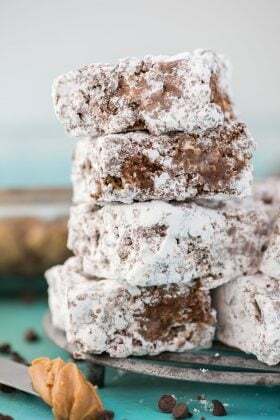 Combine the powdered sugar, meringue powder, and water in a small mixing bowl and mix on low speed until the icing has a matte appearance, about 3-5 minutes. Transfer the icing to a squeeze bottle and begin to add the details on the footballs. I found it easiest to start by drawing the curved lines near the ends, then adding the straight line in the middle on all of the footballs, then go back and add the vertical stitch marks to all of the footballs. When all of the footballs are finished and set, store them in an air tight container. These are so cute and I bet the taste great. I love game day party food. Thanks for sharing. Thank you Melissa, glad you enjoyed them! So cute! These would be the talk of the party! I love the creativity behind these! Thankfully my husband is not a sports guy, but my family is, and I cannot get into it either. I need someone to teach me how to like football! 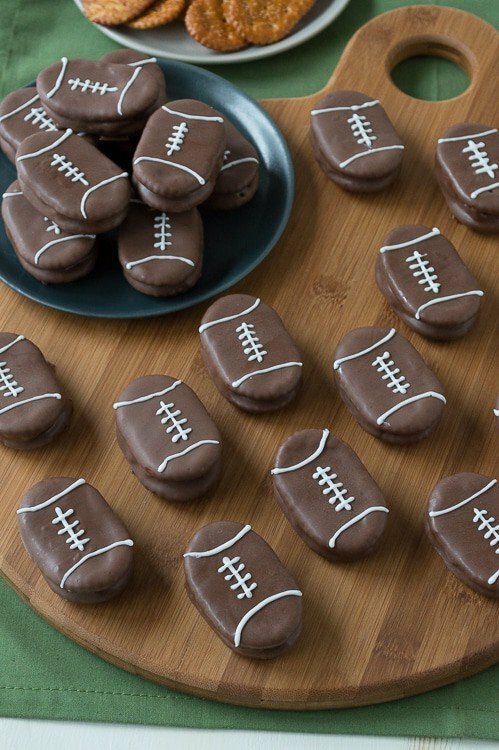 I am with you – not a football fan – but definitely a fan of football shaped food! 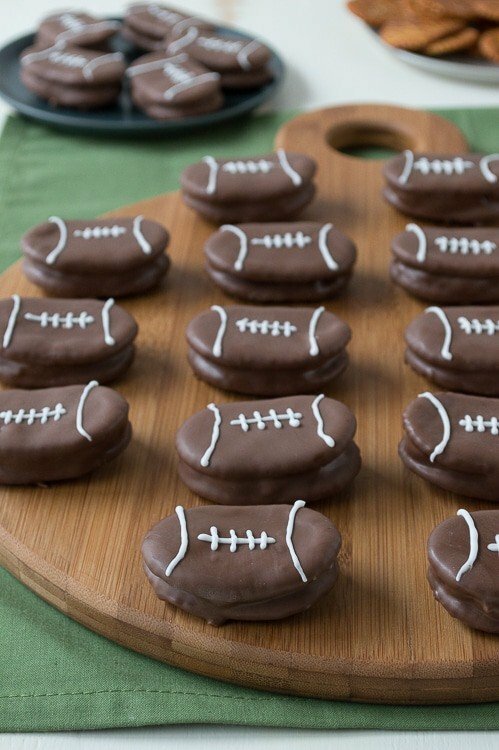 These are so cute – the most perfect treat to make for the superbowl!!! Another one for team football food!! We are not a football watching house , but I would watch just for the food! These are adorable, and I love that it’s not a cookie- so creative! I love these so much! 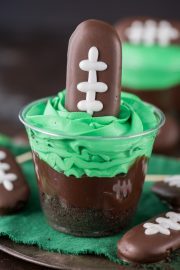 My 3 boy and husband LOVE football, I can;t wait to make these! Let me know how they turn out Lauren! I’m not a fan of football either, but football related foods are so much fun! This recipe looks delicious!! I know we’d love them! I am surprised by how many blogger’s aren’t big football fans! I’ve been excited to see these since I saw them in that photo a few days ago. They’re adorable. 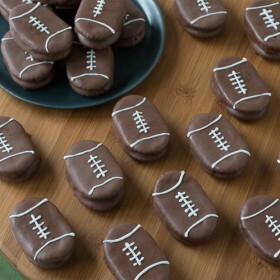 I’m not into sports at all but I love any cause to theme fun treats around! Those are so cute and they would be fun for a boy’s birthday party too! Tonia, I didn’t even think about for a boy’s birthday party, great idea! I am soooo doing this for the Super Bowl! Adorable! Beth, these are absolutely adorable! We are HUGE football fans, so we would absolutely go to town on these. Ya know, a good way to get into football is to start playing fantasy football. If you have even a slight competitive spirit, it will probably draw you in. You’ll look forward to watching your players play (and earn you some points! ), especially if you’re in a league that competes for a prize. :) In the mean time, just keep making these cute little treats! Oh! Unique advice! I never thought of joining a fantasy football league! How fun are these?! I lucked out, my boyfriend doesn’t watch sports and I love it! My husband isn’t a big football man either! Girl, these are adorable! I absolutely adore them!!!!! 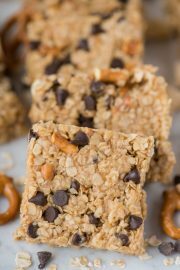 Love that you used pretzel crackers! Perfect addition to any game day spread! Pretzels, PB & chocolate = delicious!! 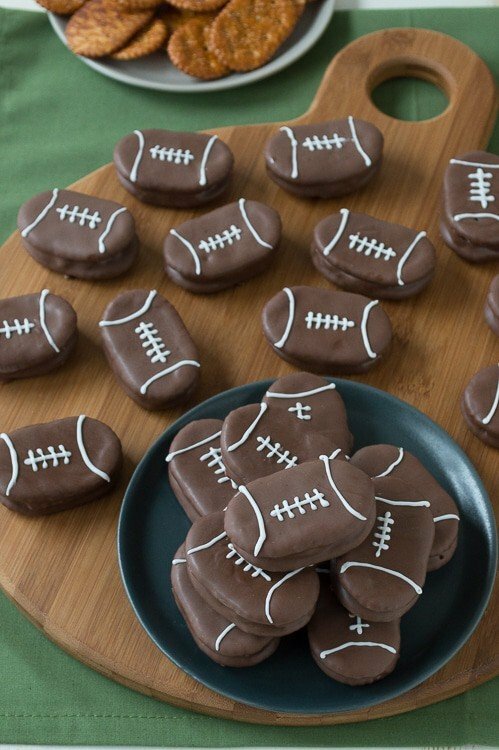 Don’t know if I can help you like football, my only tip would be learn to the game then it’s a bit more exciting :) Or just have fun in the kitchen creating cute snacks like these footballs! Good advice Kristy! I think I need a personal football teacher, someone who can explain what’s happening! 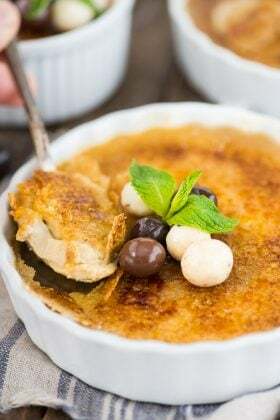 The salty sweet combo – totally gets me every time! 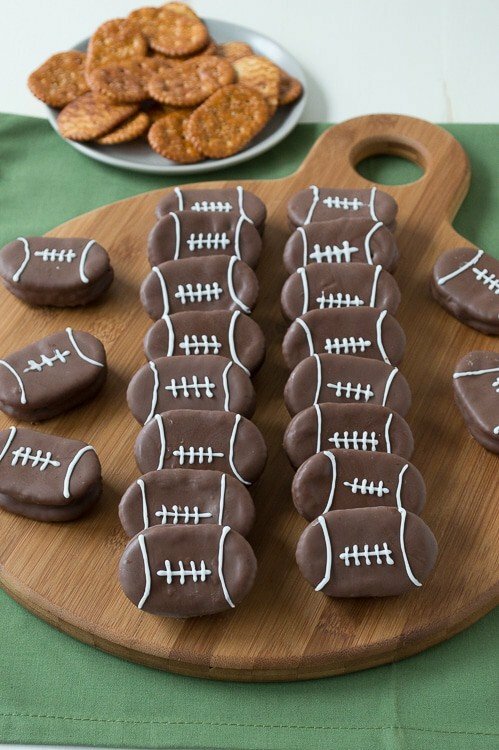 These are definitely perfect for the playoffs and Superbowl parties! I know! There is the salty sweet combo and then the chocolate PB combo!! Too cute! I’m going to have to make these for our Super Bowl party! Cindy, I hope they are a huge hit! So cute! 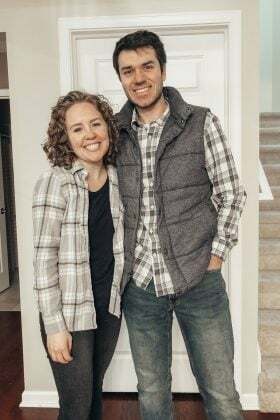 I LOVE football, but not sure I have any tips for you:( I have turned my husband into a bigger fan, but I think it was my enthusiasm and passion that helped! Good luck and Go Colts! Haha, thank you Dawn! I guess I need to find a buddy who has a lot of enthusiasm for football! You need to care about a team first. :) Pick a team for any reason and really work at caring whether they win or lose. I am a huge sports fan but my hubby not so much. Try going to a live game where the crowd really gets into it–but make sure you are rooting for the home team. Love these treats–pinned! Laura, going to a live game is a GREAT idea! These are so perfect for a party! That’s pretty much the only reason I like to watch football…for the food! Oh my goodness! They are just so so adorable. I would love to get a bite of one. I suppose you could make just one, but why not make 30?! Beth, these are so cute and I know they taste great because that is a similar peanut butter filling I use to make mock peanut butter cups! We are going to a superbowl party no matter who is playing (but we hope our Packer team will be in it! ), and I plan to make these as my contribution towards the desserts. Thanks for sharing! Yay Gail! I am so excited! My husband’s family LOVES the packers! I share your thoughts Beth, I just cannot get into football. As in actually sit down and watch a whole game. I love making snacks for our football mad guests though! These are darling! I sure hope our football loving friends appreciate the fun football food we make for them! Have you tried these with cream cheese instead of peanut butter? Hi Andrea, do you mean just cream cheese and omitting the peanut butter? I am sure you could do it, I have not tried it that way. I prefer to mix the peanut butter with the cream cheese because I don’t like the taste of cream cheese by itself. Let me know how it goes! I’m making these tmrw for Sunday’s game! 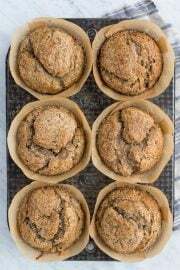 About how many does one batch with the above ingredient calculations yield? Hi Shannon! It really depends on how many crackers come in the box, so when you’re at the store you could look to see how many are in the box and half that number and that should be a good estimate (there could be a few broken ones). Let me know how they turn out! Do these footballs have to be Refrigerated since they contain cream cheese?